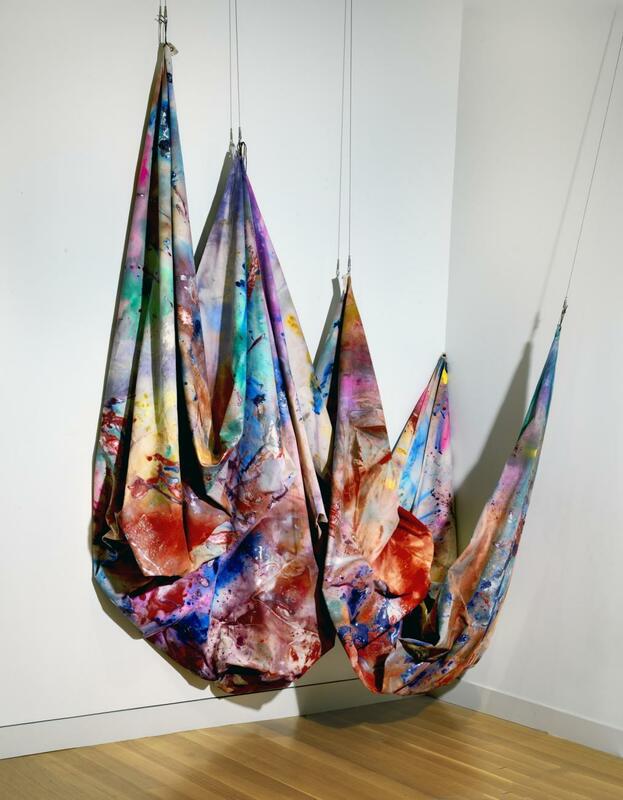 Artist Sam Gilliam is known for his vibrant, draped fabrics such as Swing from 1969. 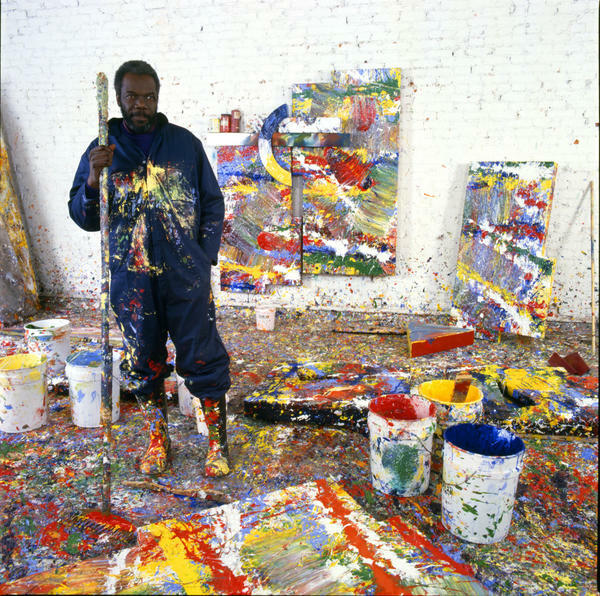 Gilliam poses in his paint-splattered Washington, D.C., studio in 1980. Gilliam created Untitled in 1968, using watercolor and acrylic on paper. Sam Gilliam found inspiration for his signature artworks in an unlikely place — a clothesline. In a Washington, D.C., studio that was once a drive-through gas station, the 84-year-old artist works surrounded by yards of vividly-painted fabric, hung like laundry from a line. The sheer, silky polyester puddles to the floor, catching light on the way down. The idea, he explains, is "to develop the idea of movement into shapes." Over the decades, Gilliam's made plenty of other artworks — black paintings and collaged pieces — but it's the 3D draping that made his name in the 1970s, and is getting renewed attention now. Back then, "it was in the air," Gilliam says. Jackson Pollock and others had been dribbling, spraying, pouring paint onto canvases spread on the floor. Then they picked up the works, and framed them. Gilliam's big idea was to eliminate the frame and hang his radiantly painted cloth in graceful free falls. He likes that it will never be hung the same way twice — as the soft folds change, so does the painting. Gilliam also works with paper — he folds it like a fan, and then pours color into it. "Once it's open you have a rhythm," he says. How it turns out is always a surprise. These are small pieces — multi-colored Rorschach blots — and they sell nicely. They help Gilliam make the big stuff — such as the yards of draping, or a large public work at the National Museum of African-American History and Culture. Gilliam's art can be hard to categorize, says Jonathan Binstock, who directs the Memorial Art Gallery at the University of Rochester. "His art is painting, but it's also not painting," Binstock says. "It's sculpture — it's also not sculpture; it's architectural — it's also not architecture. He's really established himself in a unique way in the history of art through this form." Gilliam has been having some health problems, and is on dialysis three times a week. But he's doing well. "I've never felt better in my life," he says. "I stopped drinking, I stopped smoking. I live for this period of being in the studio and actually working." It's exciting — moving colors around, seeing how it will turn out. And all that work is paying off; Gilliam's works are in major museums around the world, and he's enjoying a resurgence in popularity, with commissions, six-figure sales and recently, a one-man show in Switzerland. In his bright, northwest Washington studio, rambling a bit, his voice soft, an occasional twinkle in his eyes, Gilliam says "every work of art has a moment." Sam Gilliam is on the art world's hot list these days. He has a one-man show in Switzerland, commissions, sales in the six figures - pretty cool for an artist who had his heyday in the 1970s, when his unique draped paintings started heading into a major museum collections. Recently, NPR special correspondent Susan Stamberg found the 84-year-old African-American painter at his Washington, D.C., studio surrounded by yards of painted fabric hung from a line with big alligator clips. SUSAN STAMBERG, BYLINE: Oh, can I step on this? STAMBERG: I can even touch it. The vividly-colored, silky polyester puddling to the floor so sheer you could lift yards of it with your pinky. 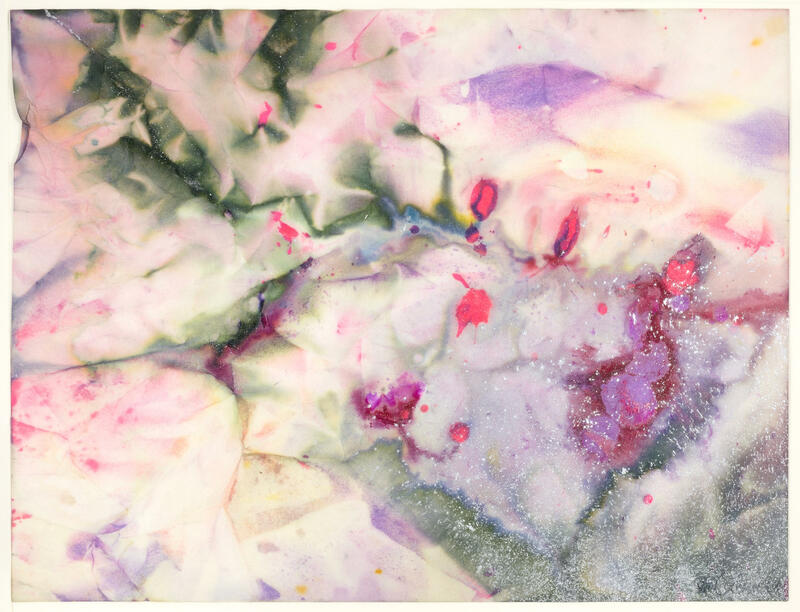 STAMBERG: This is Sam Gilliam's signature - lengths - 75, 100 yards of gauzy fabrics that he paints in gorgeous acrylic colors. And then he drapes them from walls and ceilings. His inspiration - laundry hanging on clothes lines. GILLIAM: The idea is to develop the idea of movement into shapes that go on the floor, some that go on the wall. STAMBERG: Or hang from the wall. JONATHAN BINSTOCK: His art is painting, but it's also not painting. STAMBERG: Gilliam expert Jonathan Binstock directs the Memorial Art Gallery at the University of Rochester. BINSTOCK: It's sculpture. It's also not sculpture. It's architectural. It's not architecture. He's really established himself in a unique way in the history of art through this form. STAMBERG: Are you tired of talking about the draped work? Gilliam's done other things since his first draping days - black paintings, collage pieces. But it's the 3-D draping that made his name then and now. GILLIAM: It's to be revisited. It was something that I had a chance to do. It was in the air. STAMBERG: Jackson Pollock and others had been dribbling, spraying, pouring paint onto canvases spread on the floor. Then they picked up the works and framed them. Sam Gilliam's big idea was to eliminate the frame and hang his radiantly painted cloth in graceful, free falls. GILLIAM: You roll it up like a carpet and stir it. STAMBERG: He likes that it will never be hung the same way twice. As the soft folds change, so does the painting. Gilliam also works with paper, pleating it. GILLIAM: Holding the paper like a fan and then pouring color through. And then once it's open, you have a rhythm. STAMBERG: Is it always a surprise when you unfold it? STAMBERG: Looks like multicolored Rorschach blots. These are small pieces. They sell. And they let him make the big stuff - the yards of draping, a large public work at the National Museum of African-American History and Culture. At 84, he's had his health problems. On dialysis three times a week, he's doing well. These are pretty good times for Sam Gilliam. GILLIAM: I've never felt better in my life. I stopped drinking. I stopped smoking. I live for this period of being in the studio and actually working and having a very exciting life. STAMBERG: He keeps finding excitement in the work, seeing how it will turn out, moving colors around every day. GILLIAM: Well, it's just an experiment. STAMBERG: This is just an experiment? And you're satisfied? GILLIAM: It's a very open process. You don't know that it's going to work. You just say one, two, three - pour (laughter). One, two, three - add silver and pour. And what you see is what you get. STAMBERG: In his bright northwest Washington studio - years ago, it was a drive-through gas station - rambling a bit, his voice soft, an occasional twinkle in his eyes, Sam Gilliam says every work of art has a moment. This is clearly his. (SOUNDBITE OF POPPY ACKROYD'S "QUAIL") Transcript provided by NPR, Copyright NPR.